Through the course of the following four posts, I mean to broadly delineate several distinct yet inter-related understandings of the concept of integration. First I think it fitting to note that, when circumstances required that she coin a name for her method, Ida Rolf settled on the title of “Structural Integration.” If she was a narcissist, this was certainly not evident in the name she chose for her work—only following her death did her survivors begin to call the method “Rolfing.” Both being reasonable designations, we call it Rolfing® Structural Integration. Most basic & barbarous of all interpretations of the term “integration” is to conceive of its reference to biomechanics. “Are the blocks stacked?” we might inquire relative to a given structure. 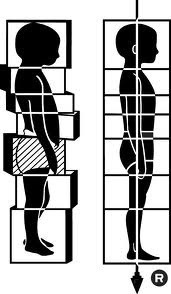 The Rolfing® logo depicts this concept. Integration emerges when the blocks relate to one another in a balanced manner. When our bones align in both stillness & movement, integration manifests. Trauma, stress & injury reveal themselves through tension in the connective tissue. The sayd tension pulls the skeleton into dis-integration, or deviation from this biomechanical balance. The Rolfer’s™ task is therefore to remove such inhibitions to optimal alignment. Integration presupposes relationship. In this understanding of the term, the relationship in question is that between the sundry segments of a supposed subject’s structure & the field of gravity as it acts upon them. It’s solid, like the trunk of an oak tree. In the posts to follow, we will consider further interpretations of “integration” in order to deepen our understanding of our work.